I just realized that I’ve been backpacking for almost 8 years now! It all started with a car-camping trip from hell. One that was complete with crying babies, crowded campsites, and garbage everywhere. We walked a short bit down a trail and low and behold, silence and solitude. I picked up an issue of “Backpacker” on my next trip to the airport, learned more about it, bought a tent and backpack, and I was hooked! David and I have experienced tons of amazing trips together all over Washington and Jackson Hole. 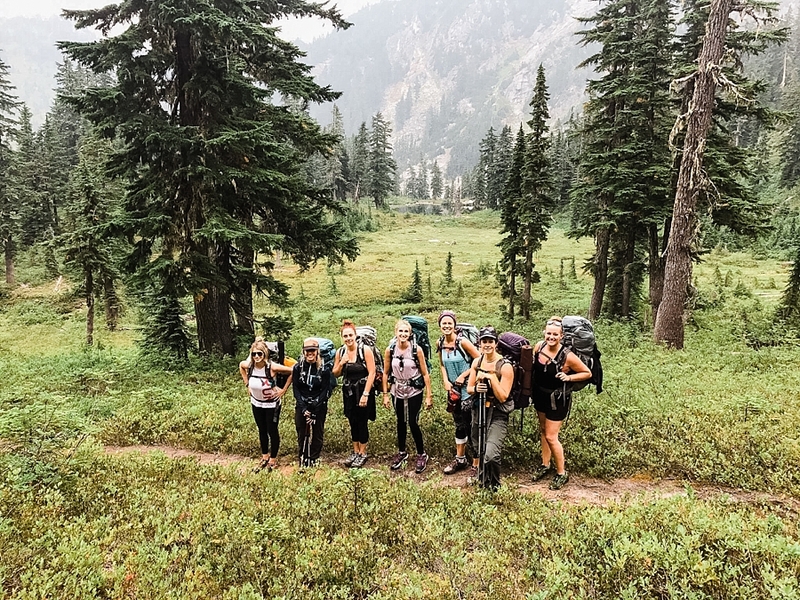 This summer, I decided it was time I introduce my love of backpacking to some good lady friends of mine. 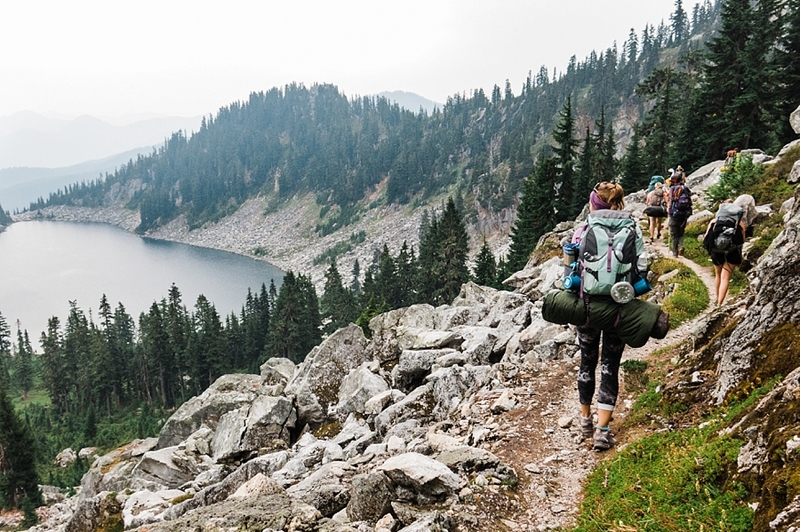 So how do you plan a backpacking trip for eight women? Some had a little experience backpacking, some had none, some had a fair amount. It really was all across the board. Well, first we made a spreadsheet of everything they would need to bring. For the shareable items like a stove and water pump, we brought just a few between all of us. I listed some food ideas, and everyone brought their own and some stuff to share as well. For the trail, I wanted something not too difficult since it would be a few of the girls’ first time. I ended up choosing a 16-mile roundtrip hike off of the well-traveled PCT. Our destination was Pear Lake! It sounded like it would have plenty of space for a group of our size (4 tents!) and didn’t gain too much elevation over the course of the hike. Not the shortest, but we certainly didn’t want to get stuck on a trail filled with day-hikers lurking in our campsite! We woke up pretty early to begin our drive from Seattle to the trailhead. It only took about an hour and a half which was great! The clouds were pretty low and rain was threatening, although none of us were too worried about it. We started up the trail to Fortune Ponds, which is pretty much a crap-load of switchbacks right from the start. I think some of the girls may have been second-guessing their decision to go backpacking at this point. Luckily, the trail flattens out and is really mellow for several miles after that. We wound through lovely meadows of wildflowers, thick forest, and even crossed a creek. Our next push took us up more switchbacks and steeper slopes, finally topping out at Fortune Ponds. These little ponds are set in a pretty little basin filled with wildflowers and beautiful peaks towering above. Oh and did I mention that there were huckleberries? I couldn’t stop eating them!! There were already a few parties setting up camp there. Despite some aches and pains and a few giant blisters, we decided to press on to Pear Lake! We had to climb up another 500 feet or so to the pass above Fortune Ponds. It was all switchbacks and I could tell some of the ladies were getting tired. Finally, we crested the ridge and it opened up to some amazing views of Pear Lake below! Everyone celebrated, then we started our descent to the lake. It wasn’t too hard to find a campsite to fit our group. We had a nice easy walk down to the lake. 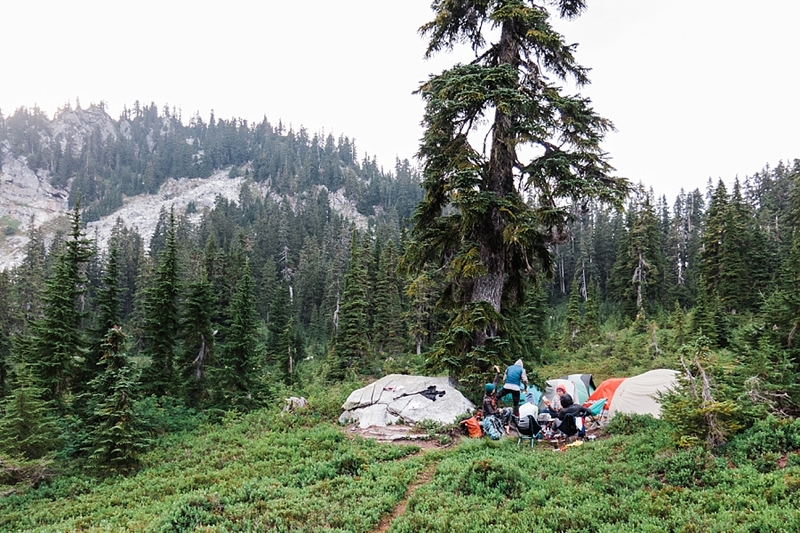 It wasn’t long before we all had dropped our packs, changed into swimsuits, and were sitting on the shores of a beautiful backcountry lake sipping wine and my personal backpacking favorite – Sailor Jerry rum. There’s just something about that caramel-y goodness that I love when I’m backpacking!We feasted on a variety of snacks, including brie & olives, along with an assortment of freeze-dried meals. It was quite the feast! Once our tummies were all full, we all cozied up in our tents under the starry sky. Turns out those low clouds really did have something in store for us. We awoke to pouring rain in the wee hours of the morning. It was then that I realized some of the girls didn’t have proper rain flies on their tents and a few woke up in puddles of water. I was happily making my coffee in the vestibule of my tent when I looked out and saw most of them were packed up and ready to hit the trail! My rain fly is pretty amazing so my sister-in-law and I continued to enjoy our morning time eating oatmeal and slowly packed up while sipping coffee. We hiked out a little later than the rest of the crew. And it rained. For all. eight. miles. out. I have to say, I was thoroughly impressed by my friends and their adaptability to everything. It’s a little nerve-wracking to take such a large group into the backcountry and these ladies simply rocked it!! We celebrated with beer and pizza in the little town of Sultan. A perfect ending to an amazing weekend in the backcountry with some of my best friends!